I tried a few different ways of adding Ombre to my card but in the end I added on a little Ombre to the bottom corner of my card. The three colours I used were Pink Pirouhette, Blushing Bride & Melon Mambo. I then stamped some flowers from Stampin’ Up!s Penned and Painted in Blushing Bride/Flirty Flamingo and Soft Sky/Pool Party. The sentiment I’ve used is from Beautiful You. Beautiful card. Love the pretty flowers and ombre background. Gorgeous! Love that pink ink in the corner! This is so pretty! Love the pink shading! Such a gorgeous Card Narelle! Those pretty flowers and that fabulous shading work so well together! 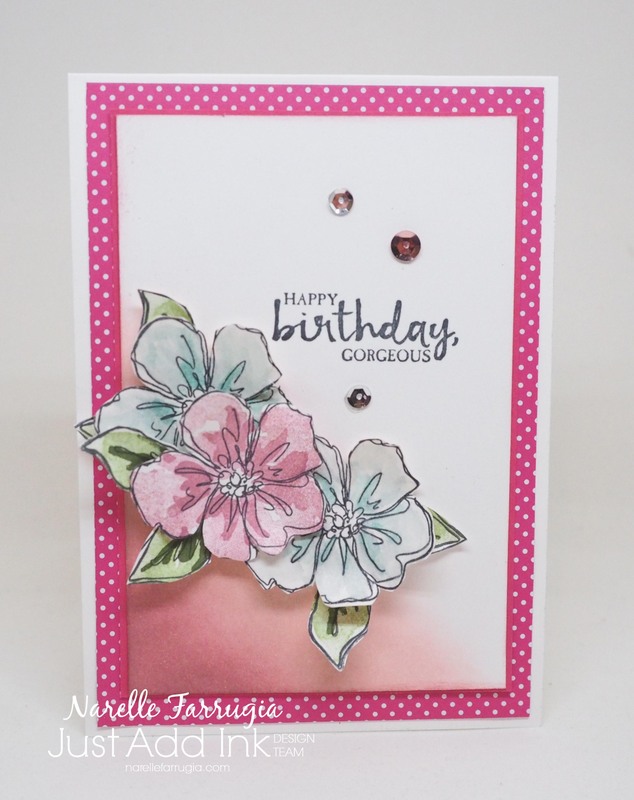 Beautiful card, Narelle! The layout is fabulous and the ombre shading in the corner really draws the eye to those gorgeous flowers. Another classic Narelle beauty. Love the soft cluster of flowers teamed with the touch of ombre. A really lovely effect.